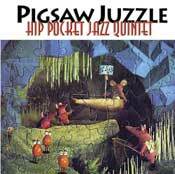 "Pigsaw Juzzle" is Hip Pocket's first compact disc release of original songs. Each song is recorded in live performance with no overdubs. Please participate in our music survey. Buy the CD for $10.